Aladdin - EYE-LITE (Bi-Color) is a small Bi-Color LED light for mobile, untethered usage. 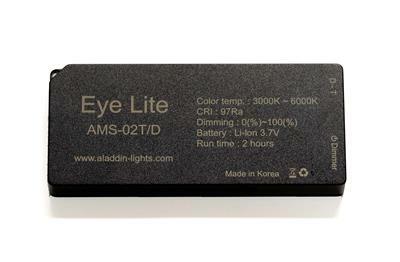 There are three different versions of Eye Lite available: Daylight, Tungsten or Bi-Color. The EYE-LITE (Bi-Color) is the newest to the family and has two integrated dimmers: one that adjusts color temperature between Tungsten (3000 DegreeK) and Daylight (6000 DegreeK) and one that controls light output - from 5-100%. The unit has an integrated lithium-ion battery that provides a run-time of over two hours. Each unit has a standard built-in ¼" thread for universal mounting and a micro USB plug for charging. The Eye Lite is ideal for many different applications. As the name implies, it's perfect for adding catch-lights in the eyes. Its power and small size allow it to be placed just about anywhere on set (inside furniture, shelves, lamps), as well as in tight spaces (cars, elevators, etc. ).